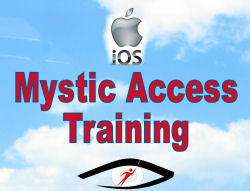 Learn to efficiently use iOS with these fun and informative modules from Mystic Access. Demonstrations will be provided during each module, and all material is recorded for your reference at any time. Completely new to iOS? Check out our first six foundational modules, too. Familiarizing yourself with a new and complex device can be stressful and intimidating. When that device has a multitude of built-in features and functions, a touch screen, a screen reader, and even more applications which can be added to broaden its appeal and scope, learning the ins and outs can become all the more stressful. Welcome to Mystic Access’s fun and informative modules on iOS. Whether you own or are considering an iPhone, iPad or iPod Touch, we offer a wide-range of materials to assist beginners and advanced iOS users to enjoy your devices more efficiently and proficiently, and to have more fun using them in the process. 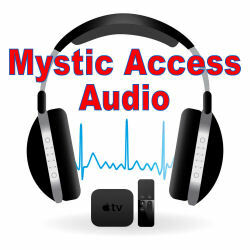 What are Mystic access’s iOS modules and how can they support me? These are modules Seven through Twelve in our iOS module series. If you’re bran new to iOS, or really struggling with more basic concepts, you may wish to check out our foundational series prior to beginning this one. Each module covers a specific topic to support you in getting the most out of your iOS device. All modules are taught from a blindness perspective, and utilize the built-in Voiceover screen reader. The modules were initially taught as live events, and are offered here in MP3 and DAISY formats upon your purchase. You may also choose to have an SD card with your modules mailed to you for an additional $15. Thorough, friendly instruction from a member of the Mystic Access team. Explanation and demonstration… we strongly feel that both these components are important to help you in understanding the material. Tips and tricks. All of your instructors are totally blind iOS users, and we all use iOS regularly for both business and pleasure. We’ll share ideas and strategies that helped us learn and improve our usage, and that we hope will assist you, too. What topics are included in this bundle? Here are the modules you’ll receive in our seven through twelve bundle. It’s important to listen to these topics in order, to best support you in getting the most value from the presented content. The iWhat? For many, the hardest part of using the iPhone is the actual phone app. In this module, we’ll walk you through all the app has to offer and will touch on three items for which we’ve had several requests. We’ll show you how to easily create contacts, successfully manage voicemail, and how to simplify the process of calling into a conference line or other automated system. Clear the Clutter. Do you have ten pages of apps on your device? Can you find what you need easily, or does it take a few minutes just to find the right app? In this lesson, we’ll talk about how to delete unneeded apps, and how to organize the ones you have so you can find them easily and quickly. With several methods to choose, you can easily find the one that works best for you. Put On Your Travelin Shoes: all about GPS Apps. In this module, we’ll compare and contrast some popular blindness-specific GPS apps. Each offers distinct features, and we’ll walk through them to help you find the app that will best meet your needs. Device Demystified. By now, you can do some exciting things with your iOS device, but do you understand how to access all it has to offer? In this module, we’ll take a look at the status bar, control center, notification area, and the dock. Editing Text. The process of editing text on an iOS device is much simpler than it used to be. This time, we’re going to show you how to edit text using the on-screen keyboard. Braille Screen Input. In this module, we’ll talk about how to get the most out of braille screen input to make text entry faster and more efficient. What is the cost for this bundle of audio modules? Each module lasts approximately sixty minutes (an hour), and includes enriching content to enhance your journey with iOS. The total duration is just over five hours and thirty-five minutes. The cost for all six comprehensive modules is $75. When these modules were taught live, participants brought their questions, frustrations and difficulties to the events, and when the answers weren’t covered in the material, they were discussed during the question and answer period. The questions and answers at the end of each module add an even greater depth to the topic presentations you’ll receive. I already know a little about these topics… will these modules still benefit me? Absolutely. Mystic access is known for thorough discussions, a down to earth and accessible teaching style and for our welcoming atmosphere. There’s a lot of free material available on iOS using Voiceover. why should I pay for these Mystic Access modules? The material Mystic Access provides is clear, concise, and professionally taught. All modules are prerecorded and edited for clarity, and all the material we teach is current as of the time of these classes, so you know what you’re learning is up to date. Between our team members, we have decades of experience as instructors. We’re friendly and genuine people, and we really enjoy sharing with you. Thank you for your interest, and we look forward to sharing these iOS modules with you.